An impressive elegantly proportioned traditional family residence occupying a most attractive mature setting in delightful landscaped grounds of approximately 0.75 acres. *Vestibule Entrance, *Guest Cloakroom, *Reception Hall, *Six bedrooms, *Two En Suite, *Main Bathroom, *Separate WC, *Lounge, *Conservatory, *Dining Room, *Breakfast Kitchen, *Sitting Room, *Laundry, *Double Garage. This charming family residence occupies an outstanding secluded setting in this very popular and sought after location. All amenities are available including local shops at Blake Street and Walsall Road, the 2,400 acres of Sutton Park, schools for all ages and regular public transport including cross city rail services from Blake Street Station. The location of the property provides easy access to motorways. re-development, stands very well back from the road enjoying a secluded elevated setting approached by a long private driveway. Reception Hall with oak stripped floor and window to front. Guest Cloakroom with shaped wash basin on stand with drawer below. South facing Conservatory overlooking the gardens at side. Terracotta tiled floor, thermostatically controlled ventilation and heating, roof lights and French doors. Dining Room with oak stripped floor and wide bay window overlooking the rear gardens. Breakfast Kitchen Inset twin bowl stainless steel sink, with waste disposal unit and filtered water tap, floor cupboards and drawers, work surfaces, wall units, inset four burner hob with extractor hood above, built in ovens, microwave, fridge and dishwasher. Ceramic wall and floor tiling and window overlooking the gardens at rear. Rear Hallway with ceramic tiled floor, range of fitted cupboards and door to front. Sitting Room with range of fitted bookshelves and cupboards and patio door to the gardens. Laundry Inset stainless steel sink with cupboards below, wall units, ceramic wall and floor tiling, gas fired central heating boiler and plumbing for washing machine. Approached by a return staircase to landing with range of original cupboards and drawers. Bedroom One with fitted wardrobes, book shelves and window with easterly aspect overlooking the rear gardens. 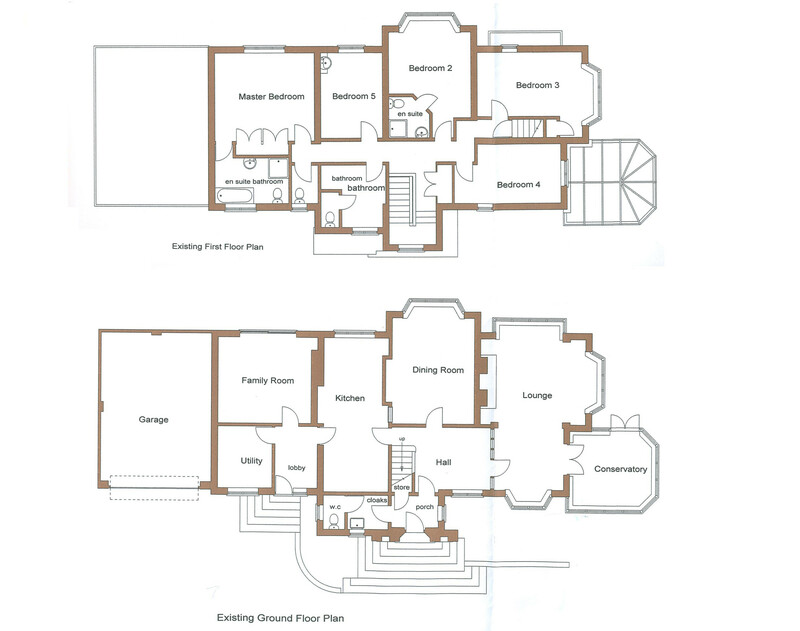 En Suite Bathroom with bath, corner shower, bidet, pedestal wash basin, underfloor heating and WC. Ceramic wall tiling and wall cupboard. Bedroom Two Bay window overlooking the gardens at rear. En Suite Shower Room with corner shower, pedestal wash basin and WC. Ceramic wall tiling. Bedroom Three with built in double wardrobe, book shelves and bay window with southerly aspect overlooking the gardens at side. Bedroom Four with bookcase and two windows overlooking the gardens at front and side. Bedroom Five Wash basin with cupboards below and window overlooking the rear gardens. Bathroom Bath with shower over, vanity unit with inset wash basin, cupboards below, mirror and shaver light above. Ceramic wall tiling and airing cupboard. Separate WC with wash basin. Bedroom Six with window to side and access to extensive roof space. Large Double Garage with remotely operated electric door, light and power. Ample parking for several vehicles. Delightful Landscaped Gardens extending to approximately 0.75 acres and including paved Sandstone patio, pathways, shaped lawns inset with borders and a variety of mature trees, flowering shrubs, bushes and rhododendrons. Two garden sheds, greenhouse and an enclosed dog run. Quantrills has been established over 20 years although the name has been synonymous with the sale of property in Sutton Coldfield since 1934.